Long walks are the bane of the match angler’s life, especially when they’re to lousy pegs. But today is not a match, so Dylan has nipped down early to claim a swim that’s not only noted for fish, but requires the shortest possible walk: peg 134, two up from Swarkestone Bridge, on the opposite bank to the Crewe & Harpur Arms. The graceful arches of the bridge certainly make this a picturesque spot. It would be a peaceful one too – were it not for the heavy traffic crossing the bridge and drowning out the gentler roar of the shallow white-water just downstream. Conditions are ideal, and the whole stretch above the bridge looks unbelievably fishy. There’s barely a breeze in the cool autumn air, and the river is at normal level with a steady flow. It’s tailor-made for the stick float, waggler or feeder – whatever takes your fancy. ‘If this were a match and I were drawn here I’d be very confident indeed,’ says Dylan with a grin. Continues Dylan: ‘There’s that many fish here you’ve got to keep feeding all the while. It’s a real working venue.’ He has brought six pints of bronze maggots and two pints of hemp. The aim is to feed maggots constantly and hope to draw the roach up in the water. ‘When that happens you can catch ‘em one a bung on the drop.’ Only if the roach stay down will he feed any hemp. Dylan sets up two rods: one with a 3AAA insert waggler, the other with a 2AAA insert waggler . In theory you catch near the bottom with the heavier rig, then up in the water with the lighter one. In practice, the lighter rig can work better when they stay down, and the heavier one when they come up. You only find out by chopping and changing. ‘If I don’t get a fish inside ten minutes I’ll be astounded,’ says Dylan, picking up the rod with the heavier rig. ‘In fact, I wouldn’t be surprised if I got one first chuck.’ He sets the float to fish about 1.8m (6ft) deep, baits the size 20 hook with a maggot, and casts out 20m (22yd). There’s no need to plumb the swim. He knows it’s roughly 2m (7ft) deep along here, and can deepen up a few inches each cast until the float starts to drag under, then take it from there. Sometimes you catch by fishing at almost the full depth; at other times it’s better to shallow up. The float travels halfway down the swim then plunges under. Dylan chuckles as he smartly sets the hook into a plucky 6oz (170g) ‘puppy’ chub. And he hasn’t even put any feed in yet! ‘I told you,’ he says. Usually the wind blows downstream here, in which case it’s best to sink your line when fishing the waggler. But today, what little wind we have is blowing upstream, so Dylan is fishing a floating line. To prevent a bow forming and dragging the float towards the bank he mends the line occasionally with a practised flick of his wrist. He feeds two lines each cast: one, about 20m (22yd) out, with some 40 maggots; the other, about 10m (11yd) out, with some 20 maggots. This way, if he misses a bite on the far line he can let the float go down again on the near line, giving him two chances of catching each cast. Ideally you should feed first, then cast, so your hookbait falls naturally through the water with your feed. But if you’re not quick while, you are less likely to lose your fish to your upstream neighbour, and you have an area offree water in front of you in which to play fish without scaring the rest of the shoal away. On Dylan’s fifth cast the float holds up, and he hits a bleak. ‘Don’t worry, they normally show early on here, then disappear,’ he says. Two good bites are missed, then it’s third time lucky as the float shoots away and another chub of about 6oz (170g) comes splashing in. Suddenly Dylan’s into a much bigger chub that forces him to backwind and makes the line sing in the breeze. Then it just seems to give up and rolls meekly into the landing net. It weighs about 2/ilb (1kg). Two casts later a lJ4lb (570g) chub is in the net, then the swim goes quiet. Reverting to feeding both lines, Dylan switches to the lighter waggler on the near line, with two maggots on a size 20 hook, set to fish just off the bottom. He starts catching small roach and skimmers, plus the odd chub to 2lb (0.9kg). Some take on the drop, others near the bottom. A quiet patch follows, with only occasional bites, most of which he misses. The breeze is getting up, making it hard to spot bites. He goes back on the heavier rig, set to fish just off the bottom, and switches between lines. He also changes to a size 22 hook and single maggot. He tries the lighter rig again, with a size 22 hook and single maggot, and concentrates on the near line. ‘It might just work for the bigger roach,’ he says. Sure enough, the first of several 10oz (280g) roach soon takes the bait. At one o’clock Dylan stops for lunch. 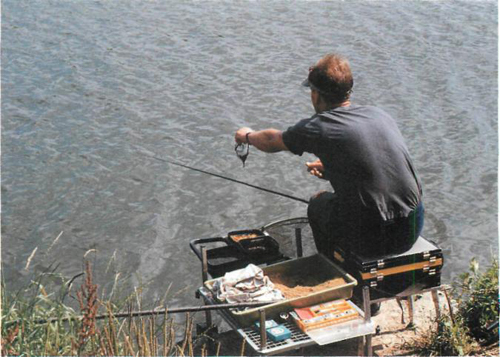 He has fed just over five pints of maggots for well over 20lb (9.1kg) of fish.